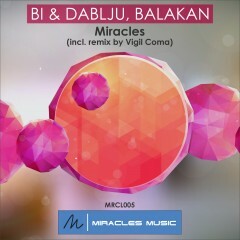 Abstract, mystical original mix created by Bi & Dablju project in collaboration with Balakan with soft and melodic remix by Vigil Coma. It’s the Miracle. Release already supported by Danny Siberia, The Mekanism, Volodya Borisov (Radioteka), Saccao, Enhe, Philip Downey, N-junior, Stacey Pullen, Tpolar, Deephope, Deepinradio.com, FNOOB House Radio, Hyricz, Norbert Meszes, Ken Fan, Arkay etc.